What is Sufism? Who are Sufis and are they guided by books? How to recognise a fake Sufi? Find the answers in Younus AlGohar’s enlightening lecture on Sufism. – These are the most turblent times in human history. The turbulence is caused by religious malfunctioning. Radicalisation is being hammered into the minds of youths and aspiring Muslims by the ignorant scholars of the religion who claim to be Sufis. – Tahir ul Qadri claims to be a Sufi scholar; all the knowledge he has about Sufism is what he has gathered from reading thousands of books on Sufism. This is not how you obtain guidance. – God dispenses guidance in different ways, however, the recipient of guidance is your heart. Opening of the Spiritual Heart is the gateway to Spirituality and Sufism. If you claim to be a Sufi but do not know about Opening of the Spiritual Heart, you are a greater terrorist than Abu Bakkar al-Baghdadi. Editor’s note: the following is the second lesson in Younus AlGohar’s course on Self-Awareness, Level 2: Emotional Intelligence. For better background information, read Self-Awareness, Level 1, in the Messiah Herald. Read Self-Awareness, Level 2, Lesson 1 here. Spirituality is fundamentally the original knowledge of human beings; their existence, their functions and their beings. Senses, which are numbered as five in total, are related to the five souls in the human breast. It makes it really easy to understand that due to the fact that these five souls are enclosed in our bosoms, we have emotions and other senses. Animals do not have these senses. The most common functions of the souls which are open to all souls, like emotions and empathy; sometimes, human beings who do not get to enlighten their souls have problems [with these functions]. They lose some of the senses because the souls are badly damaged or diseased with some evil ailments. Some people stop having empathy and sympathy for others; they stop feeling the pain of others. We know them as self-centred people. What exactly happens when somebody has all the feelings of his or her pain but does not feel the pain of others? This is due to the fact that the souls responsible for upholding the sensory system of five senses are diseased and are now malfunctioning. You must have seen people who may be easily regarded as stone-hearted or hard-hearted. You must have seen such people in your vicinity – at work, school and religious places. Something goes severely wrong when the souls inside the human chest go wrong. Malfunctioning of these souls result in having no empathy; people suffering from malfunctioning souls do not sympathise with anyone. They become egocentric, stone-hearted and blind to any compassion. These things can only be understood with the help of spirituality because they are to do with spirituality. It is not the body which has the outburst of emotions. Emotions are a very spiritual, abstract thing. You don’t see them, but you can feel them. We live in a very strange world; when somebody has emotions, we say, ‘This person is too emotional.’ Intelligence is part of emotional intelligence. If you don’t have emotions, you are an animal. Animals don’t have emotion because they don’t have the five souls in the breast. If you are a human being and still you don’t have emotions, it means your souls are severely diseased. Most of the time, many people who are not spiritual are only concerned about their own emotions. They don’t care about others’ emotions. Whether it is their friends, spouse, father, brother or sister, they are not bothered. Emotional intelligence is the ability to identify and manage your own emotions and the emotions of others. The mismanagement of emotions is extremely dangerous. For example, if you spill a glass of water by mistake, you would forgive yourself without hesitation. You will not even say, ‘I’m sorry, please forgive me.’ I don’t have to say it. However, if somebody else does it, you would say, ‘Oh my god, look at them!’ Things will go out of proportion. This is because, emotionally, you are not intelligent. You have problems with identifying the emotions and managing them. When you were able to remain quiet when you spilt water because you knew that you did it, why couldn’t you control your emotions when somebody else did it? For example, some people, when their toddlers are crying, they give them chocolate. They know that it is not good for them, but they give it to them just because they want some peace. If somebody else was doing it, the same people would erupt in an outburst of emotions. In the management of emotional intelligence, the first skill you must master is emotional awareness. For example, let’s say somebody does something wrong and by looking at his face, you see that he is full of emotions. He is so sorry; however, you don’t read it. You say, ‘He didn’t even say sorry.’ Look at his face! You are so blind and cannot read emotions of others. So, you are not emotionally aware. If somebody’s face is all swollen, their eyes are red, they look sombre, gloomy and distressed – and still, you can’t read it, it means you lack awareness of emotions. When you are happy, your body is so transparent, it cannot hide your emotions. Your face is so transparent it is like a revealing, see-through dress. The emotions are peeking out. When you are happy, your face is [bright]. When you are sad, your face will seem to have some swelling. When you are angry, your nostrils flare. Emotions do not need a language. Emotions don’t need your permission. They will manifest before the world. They are self-expressive; they do not need extra help. When there is an outburst of emotions, the emotions will manifest upon your face. The face will go to the backstage and emotions will come to the forefront. When somebody does a favour to you and now it is your turn to be thankful to them, some people think by saying, ‘Thank you,’ they have done their job. You don’t see the emotions of gratefulness upon their faces. This is because they are emotionally dead. Some other people say, ‘Thank you,’ but with the emotions of hatred. Appreciation is an exhibition of emotions, my friend. Appreciation doesn’t consist of words only. In a similar way, when you are grateful to God, you say, ‘Thank God.’ When you are thankful to somebody, you need to express your emotions. That exhibition of emotions is the true form of appreciation. When somebody is doing a favour to you, it is natural to exhibit some emotions of gratefulness. Gratitude is not just two words, ‘thank you’. In order to become a good human being, you must be emotionally intelligent. Have you been in a situation where you see that some people are really disturbed and quiet, while others in the room are not bothered about their emotional state and are laughing and making jokes? I think this is a mark of a bad character. When we see that somebody is upset, for any reason, we should respect his emotional attire, condition and the situation he may be in. We should give him space. We should not make an environment where somebody feels, ‘Nobody is bothered. They are spiritually so dead, they cannot see my face. They cannot even see how sad I am and they’re just making jokes.’ This is also very important. If we must [be jubilant, we should leave his presence first]. We can comfort him and say, ‘Everything will be okay, don’t worry.’ Words of comfort don’t mean anything, but it comes under mannerism. Some people criticise you for the sake of criticism. Not a lot of people criticise you to reform you. Some people just try to boast themselves and put allegations on others. That is not true criticism. If it is true criticism, you must reflect on your actions and deeds. Then again, in the very first instance, you need to know whether the criticism is positive and coming from a fair-minded person, who doesn’t hold a grudge against you and who is not a habitual nagger. Some people just use everything as an instrumental to disrespect, insult you and find flaws with you. Even if there are no flaws in you, they must find a flaw with you. They become oblivious about their own being; they are totally oblivious to who they are and how good or bad they are. You must know when you are criticised, whether or not that criticism is positive. On the other hand, do not make this as an excuse [not to listen to the criticism] at the same time. Sometimes, you say, ‘I don’t care because it is not a positive criticism; let them say what they want,’ because you need an exit without guilt. You have to be pretty sure whether or not that person is a genuine critic. If that person is a genuine critic, then you must hear him out. It is like a blessing if you have a positive critic around you. Then, in that case, you don’t have to work hard on correcting yourself. They will criticise you positively, then you will take note of what they are saying about you and you can correct yourself. A positive critic is the best of your mates. How do we learn to stay calm? First of all, we need to understand what exactly does the phrase ‘under pressure’ mean? You go under pressure when you know exactly what your problem is and then you get frustrated. Sometimes you get frustrated when you fail and you don’t achieve your goal. That is when you are justified to be frustrated. You are allowed to be frustrated; however, you must fulfil the requirement of frustration. There are two types of frustration: original and false. Frustration is justified when you know there is a problem and you have been working on it; nothing seems to work and then you are helpless, clueless and you don’t know how to resolve the problem. You have applied all your skills and energies and still, there is no result. This feeling is true frustration. But sometimes, you don’t even try [to fix the problem] and you impose frustration on you. That is false frustration! A lot of people fall prey to false frustration. Some other people who are not connected to God, who are not spiritual, what will they do? They will simply go to the church or temple and say, ‘God help me!’ God will never help them and this will only add to their frustration. In our case, when we are helpless, we should not be frustrated. When we feel helpless, we always turn to His Divine Eminence Gohar Shahi. Some people don’t even try to solve the problem. They skip this stage and go straight to asking for His Divine Eminence Gohar Shahi’s help. That is wrong. Don’t do that. Try to fix the problem first with all the skills and energies you have. His Divine Eminence Gohar Shahi’s help will definitely come when you are genuinely helpless. Why should HDE Gohar Shahi help you when you are able to resolve the problem yourself? But we have become habitual of doing this. If anything goes wrong, we immediately say, ‘HDE Gohar Shahi, help me; Jesus, help me.’ Jesus will not help you because you are not a genuine seeker. Your quest for help is not genuine. Only pray to God for help when you cannot help yourself. In fake frustration, you are never helped out and you lose trust in God. You don’t make an effort and you call upon God to help you. Obviously, God will not help you because your frustration is not genuine. As a result, you become depressed and lose trust in God. This is so dangerous. So make sure your frustration is original frustration. God helps those who want to help themselves. That will happen when you have tried everything and now you are genuinely helpless; you are lost and do not know what to do. Then comes the Lord’s help. Maybe before you even say, ‘HDE Gohar Shahi, help me,’ HDE Gohar Shahi will help you. There is no room for frustration in a spiritual person’s life because frustration is a condition where you are helpless and there is nobody to help you. A disciple of HDE Gohar Shahi and those who are actually connected to Jesus can never be truly frustrated because they are not helpless. So we have to remove this word frustration from our life, practically. There is no room for you to have frustration in your life. You must abide by this. Frustration comes when you become completely helpless and HDE Gohar Shahi is our Lord, we are not unattended for. This is the answer to handling setbacks effectively. Try your best. God doesn’t like it that there is a problem and you’re not making an effort to resolve it. God will never help you like that. Make as much effort as it is required. Even after everything you have done to resolve the problem, there is no result and you are clueless and feel helpless, then call upon HDE Gohar Shahi. I guarantee that you will be helped straight away. When the Lord’s help arrives, there is jubilance, not frustration. There are two skills involved in emotional awareness: the ability to identify your emotions and ability to identify others’ emotions. When somebody is injured, you bring out a First Aid kit. In a similar way, if somebody is sad and under the outburst of emotions, you should try to comfort him and harness his emotions. Make sure that his emotions do not become overwhelmed. If your emotions become overwhelmed, you will push yourself into the depth of depression. If you are there and you see somebody is under some kind of emotional state, you should have the expertise of controlling and making use of those emotions in solving problems. If somebody is sad and you also go there and you tell them stories which will increase in their sadness, then this is backfiring. You should comfort them in a way that it appears to be genuine to them. Tell them, ‘Don’t lose hope in God. God will help you. Bad days do not stay forever like good days do not stay forever.’ Give them a practical approach in order to solve their problems. Don’t give them false hope, but at the same time, give them calculated hope. The same thing goes for yourself. When you are emotionally down, you don’t want to talk to people. This is bad because you are shutting the door on any help that might come to you. Some people seek isolation when they are emotionally down. That is not going to solve the problem. If you have a problem, find a practical solution. You have to make efforts. When some others have a problem, they become hostile to everybody. You must manifest humility and modesty at all times. If you think that you’re the only one in the world who has a problem, you are severely mistaken. Every single person in this world is laden with trouble; but the thing is, everybody thinks his pain is greater than everybody else’s. Do not seek isolation when you are emotionally down. When you seek isolation and you are emotionally down, the chances are that you are pushing yourself into a deep depression. If you are sad, seek a solution. Always leave a door open for someone to come and help you. Keep your head cool so that you can solve the problem. Don’t become unreasonable. Tell yourself, ‘It is not the end of the world. I will find a solution.’ Sit down and find a practical solution. If you cannot help yourself, nobody will care about your life. If you don’t want to help yourself, why would the world help you? When you are helping yourself, then foreign aid will come. However, you should be the first one to help you. How do you keep cool? If you have a problem, think about how to solve it. Calculate. After your calculations, you know what to do. When you know that something can be achieved, keep cool. You should be worried when you know it cannot be done. There is no problem that cannot be solved! 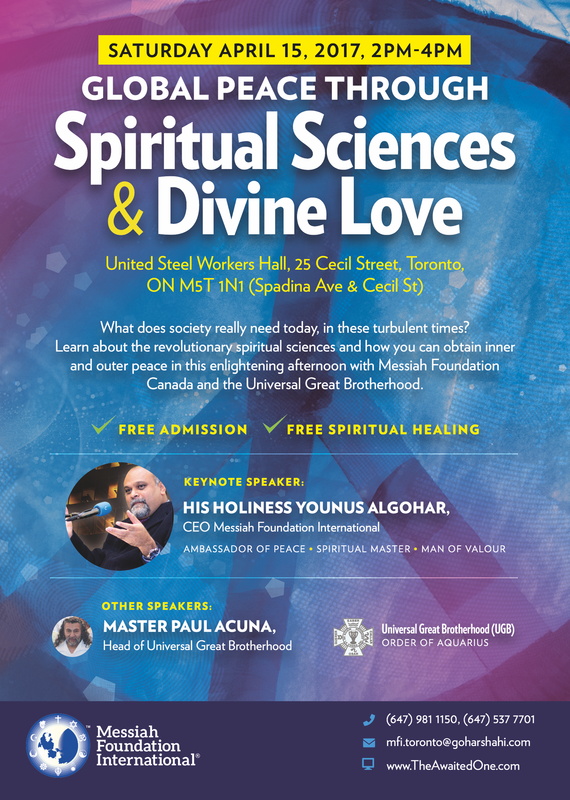 We at Messiah Foundation Canada are extremely pleased to announce our latest collaboration with the Great Universal Brotherhood in promoting global peace and the spiritual sciences. The event features the Official Representative of the Awaited One Lord Ra Riaz Gohar Shahi, His Holiness Younus AlGohar, who will deliver a lecture on spirituality and divine love as well as answer questions from the audience. The conference is to be held in United Steel Workers Hall, 25 Cecil Street, Toronto, ON, M5T 1N1 (Spadina Ave & Cecil St) between 2 PM- 4 PM. Entry is completely free and people of all backgrounds and faiths are welcome. We will be offering Opening of the Spiritual Heart and free spiritual healing. Learn how to bring everlasting peace into your life with the Goharian Doctrine of Divine Love! The full lecture is available in English language on the AlRa Tv YouTube Channel. Press the play button above to watch the video. Editor’s note: the following is the first lesson in Younus AlGohar’s course on Self-Awareness, Level 2: Emotional Intelligence. For better background information, read Self-Awareness, Level 1, in the Messiah Herald. Emotions are, oftentimes, a set of reactions to things. Whether you are being grateful to God or you’re being thankful to your fellow men; whether you’re unhappy with yourself, with your fellow men or with God; it is all reaction. You will see people with positive and negative reactions. Some people are more likely to exhibit positive emotions. Some others tend to be very economical with exhibiting positive emotions. Sometimes, you will see people with only negative reactions and emotions. You’ll wonder why such people only exhibit negative emotions, and why their reaction is oftentimes more severe than expectations. This is all human psychology. Our brain is the centre point where everything is cooked. Some people spend 16-18 years in school, college and university. They become discerning, learned individuals. They think they know everything, but that is foolish. There is so much knowledge. There is so much to know about so many things in your life, that you can never learn enough to understand everything. Psychology on its own will tell you nothing. With just psychology, you will become a sophisticated mind with a lot of unresolved, mysterious stories in your brain. For example, psychology is the study of human behaviour, but it doesn’t tell you what it is that human behaviour depends on. It doesn’t tell you how human behaviour becomes positive and how it turns negative. Psychology is all about human behaviour but it doesn’t tell you the source; it doesn’t tell you how to manoeuvre your emotions. Emotions are like a tennis ball that you throw at the wall and it rebounds back to you. Sometimes, somebody will say something you don’t understand; you’ll derive a desired meaning out of what they said and get angry. When you get angry, there will be an outburst of unclassified emotions. What happens when somebody is not sound by mind? Oftentimes, unruffled, undisturbed peace surrounds him; even then, there is an unsolicited reaction. He’ll just be sitting in solitude and sometimes he’ll cry. Other times, he’ll smile. When you ask him what happened, he will say, ‘Nothing.’ What is it then? You’ll be thinking about something nice and that nice thought will have a rebound. There will be a reaction: you will feel happy. This is self-acquired happiness. Then you will think of something really horrible and have all sorts of ideas. [You’ll draw conclusions based on your own estimation]. This is how you manipulate your brain. Some people have a habit of thinking too much. If you wear a jacket every day, it will wear out very soon. If you use your tongue a lot, it will wear out one day. Then after that, anything that comes from your mouth will be nonsense. In a similar way, there is a gateway between the conscious mind and subconscious mind which is opened when you overload your brain. You won’t even know who is coming and going. Thoughts will be coming like rain from the subconscious mind. You won’t even be thinking about something, but the thoughts will be coming. The IQ (intelligence quotient) level is all about putting every piece of information in your conscious mind. For example, you walked through a street. When you walked through the street, what did you see and did you think about it? That is what your IQ level will be judged upon. For example, where I am sitting, there is a laptop, laptop case, bag, bottle of water, juice, glasses, phone, small fan, light and wall socket. It is like you have £100 in £20 and £10 notes and you only pay attention to the £20 notes because £10 notes are of less importance to you. You’ll put the £20 notes somewhere safe; you’ll put the £10 notes in your pocket and you won’t notice that they are falling out. To improve your IQ level, when you look at something, pay attention. When you pay attention, that information will be stored in your conscious mind. For example, you walked through a hallway and didn’t notice the glass of water on the side. If someone says, ‘There is a glass here,’ you’ll say, ‘Where? I didn’t see it.’ You saw it, but you didn’t pay attention, that is why it is not in your mind. Some people are so confused; they can see the glass, but there is no coordination between their mind and their eyes. Your eyes are cameras. If you keep your camera on, it will keep showing pictures and images, whether or not you want to see them. In a similar way, your eyes and ears record every image and every word. Thoughts, things – anything you notice and hear – if it is done with attention, it is stored in your conscious mind and improves your IQ level. If you see someone beautiful and don’t show emotions, you [are not mentally sound]. If I see a beautiful woman walking, if both my IQ and EQ levels are good and I’m not religious, I must say, ‘Wow, beautiful.’ This will mean I have a healthy brain. In order to improve your IQ level, you have to work on your EQ level. You become ill mentally when your IQ level lacks emotional intelligence. Show emotions! For example, a room is messy and stinking, but you will see someone sleeping there because he lacks emotional intelligence. His emotional sensory system is not responding to the fact that the room is dirty. This means that there is something wrong with his emotional sensory system. He will see that somebody is handsome and beautiful, but he won’t care. This is a mental disorder. Another scenario is if something has fallen on the ground in a restaurant kitchen. All the workers, rather than picking up the fallen object, prefer to step over it and be on their way. This is because their brains are not working properly. They become naive to everything and are not aware of the intelligence of emotions. This is why they have turned into cabbages. You’re sitting and with a bird’s eye view, you have seen everything. Your eyes have stored all the images. Sometimes, we just see things without [hearing them]. Our eyes record those images and they go into the back of our mind, stored in the subconscious. Oftentimes, when those images reappear before our eyes, we wonder what it was. Your eyes have stored the images but you didn’t pay attention, this is why the information is incomplete. This is why your thoughts are ruffled and disturbed. When you are somewhere, in order to have a healthy mind, you must see things with attention. If you don’t pay attention, this image which is stored in your subconscious mind will not have enough information and then it will trouble you later on. At home, if somebody knocks on the door, I ask, ‘Who is it?’ I am not bothered about who comes and goes, but I need to know. This is because if somebody was knocking on the door but I don’t know who it was, this thought that somebody came and knocked on the door will be stored in my subconscious. It will bother me later on. Be careful: your eyes are like spy cameras. Everything is being stored. You want to make sure that everything being stored by your sensory system is not incomplete. Pay attention so that every piece of information is complete. When there is full information, your mind will be healthy. You will never be under any delusion or have any doubts. Oftentimes, when people close to me are annoyed and irritated, I want to know why. I cannot feed my brain with incomplete knowledge. This is important for me. For example, if you leave your phone at home at 3 AM, you’re walking alone and you don’t tell anybody where you’ve gone or why, [this will disturb me]. This is the inquisitiveness of my mind. I have trained my mind not to store anything incomplete. I need to know the reason. Right or wrong, I don’t care. I’m only concerned that when this information is stored in the back of my mind, it is not incomplete. You need to be careful. Everything is being stored. What you need to do now is, whatever is being stored should be stored along with relevant information. If the information stored in your mind is incomplete, your IQ level will go down. IQ level is judged by what you have in your conscious mind and how much your conscious mind is affected by your subconscious mind. When you know everything which is being stored, this information will never go into the subconscious mind because it is not useless. The more information is stored in your conscious mind, the more intelligent you are. Some people make a mountain out of a molehill when they have pain. When somebody else has pain, they think, ‘It is none of my business.’ Such people are emotionally dead. This is the initial introduction to the type of psychology I am imposing on you. This will go on for seven days. I bet after the completion of Self-Awareness Level 2, you will think you are a saint because you will stand on a street and you will know everything. You will know why people are doing what they are doing. This is IQ and it is accompanied by EQ level. If the room is stinking and you are comfortable, you are a cabbage. You are unresponsive. When you are sitting somewhere, your eyes are storing all the images and you’re not paying attention to it. You’re completely ignoring their existence. This is where your IQ level goes down. It doesn’t take too long. Wherever you’re sitting, you can see things; just pay a little attention and complete the information. For example, I need a glass and there is a glass nearby but because I didn’t pay attention, the image of the glass is in my subconscious mind, but the information is incomplete. Then I’ll ask someone to bring me a glass and they’ll say, ‘It is there.’ This sort of thing happens many times with so many people, but why? In Self-Awareness Level 2, we will deal with IQ and EQ. Then comes higher awareness: awareness of God in you. Now we’re talking about awareness of you in you; in the third level, we will all talk about God and his presence inside you. Who is behind the scenes working in you? Level 3 will help you know who is inside you – God or the Devil – and how to detect it. Self-Awareness Level 2 will go on for seven days. I guarantee you that after these seven days, you will have a lot more understanding of life and a lot more confidence. Younus AlGohar explains how the illusions we create affect us and how to find out who you are in the mirror of the truth in order to adopt a lifestyle which agrees with your nature. His Holiness gives a guideline on how to overcome your failures and live a balanced lifestyle. – It is very rare that any relationship is crystal clear, however, when the illusion we create of a relationship shatters, it can be painful. Some people are addicted to bottling up their emotions out of fear of exposing their flaws to the public and damaging their perfect image. Even this fear could be illusionary. Most people in this world are pious because they are hiding their true character; they have two faces. – Most of the time people already have a self-fabricated stories about us in their minds which they use to judge us. It is very important to find out the intention behind somebody’s action before you judge them. Some people’s intentions are clear through their actions, however, some people struggle to convey their thoughts and talk backwards; this happens when you do not know what you want, you suppress yourself because you adopted a lifestyle that doesn’t agree to your nature. – Knowing yourself in the mirror of the truth: how does your mind react to emotions? To weakness? To strength? When the mind doesn’t react to weakness perfectly, we are most likely to fall into the ditch of inferiority complex. Failure pushes you to feel inferior, but you need to learn: you are not inferior because you failed. You need to rectify the mistake and move on. – HDE Gohar Shahi said: ‘Neither inferiority complex nor superiority complex is a good thing. Stay in the middle.’ You should attribute your successes to the important decisions you made in your life and your failures to the mistakes. This is balance. – Before finding faults in other, keep a check and balance of yourself. We should know who we are. We should know how balanced or imbalanced – spiritually or emotionally – we are. There are physical diseases which we know the symptoms for, but what about the emotional, mental and behavioural diseases? These are the issues nobody knows how to deal with. Festivity and celebration is what the religious people are left with today. If it’s Prophet Mohammad’s birthday, Muslims will say, ‘Okay, let’s celebrate.’ If it’s Christmas, Christians will say, ‘Let’s celebrate.’ However, thinking of getting enlightened and finding God is not something you hear from people. This is because a lot of people in this world today are from the category of those who leapt towards the modelled luxuries of the world. But among those people who are craving the luxuries of the world, there has been a group of people who have already enjoyed the Divine Nearness. They enjoyed divine love even before their entry into this world. They are the people of love, peace and divinity. This message of His Divine Eminence Gohar Shahi is to facilitate those who seek love of God no matter what religion they come from – regardless of whether or not they believe in any religion. This mission of HDE Gohar Shahi is to help out those who are blindfoldedly following shadows in search for God. It has been centuries since the last man journeyed on the path of God. For centuries now, people have sought asylum in the temples, mosques, churches and got themselves engaged in whatever form of worship they were given to do. You may feel something very important is lacking in your life and you think Islam, Christianity, Judaism or Hinduism will fill the gap. If you go to a temple, church or mosque for this reason and you find solace, do not settle for it! This unreal solace may be coming from Satan. Remember that God is not easily pleased. If you find solace in a mosque or a temple, it may be an evil projection; that solace is to stop you from searching for God. You will not see God sitting in a mosque or temple and you will never find Jesus in the church. Make sure your journey does not stop in those worship places! There is no highway that leads to God, but there is a small tunnel beneath your body. Mosques, temples and churches are highways; if you are in search for God, avoid the highways. You want a Goharian channel which will put you through that tunnel. The tunnel starts from your heart. Very discreet is this spiritual journey; nobody will know that you are travelling. It is so discreet that sometimes even you’ll [doubt] whether or not you are travelling because it is the journey of your spirits. It is not done by your body. Your body is like an outfit [for your souls], nothing else. It is the devil’s job to stop people from going to God. Whether you are lost at the cinema, nightclub or in the mosque, to him it is equal. As long as you are heedless of God or of the way that leads one to God, the devil is perfectly fine with that. In fact, he is pleased because he doesn’t have to do overtime. I recently spoke about how and why a vast majority of Muslims in Pakistan oppose HDE Gohar Shahi without reason. It is all negative [propaganda]; they do it to save their own skin. The people who purport to be religious leaders there are businessmen who are selling religions and God’s name. They are making a mockery out of the religion. The reason why we have to put up with a lot of undue and unearned opposition from some people is because we talk about the tunnel. It is because we secretly transport hearts to God. Perhaps it is called ‘mysticism’ because it is hidden. From someone’s physical features, one cannot tell if somebody is really travelling towards God. It is not you, it is your heart that travels the journey. The good thing is, with the help of Live Stream, Youtube and Facebook now the message of peace, love and truth will reach common people. In no time, the message of HDE Gohar Shahi will take the world by storm! This is divine, unstoppable magic. This is the magic of love. One fundamental difference between man and God must be understood by [people of] all religions. As a human being, you only bear the divine image; this is what you were created upon by God. You are only the divine image and you are imperfect. You will become a perfect human being when the divine image that you have been created upon will be filled with the divine characteristics. The divine characteristics do not come about by reading holy books. The message of HDE Gohar Shahi is very precise, surgical and technical. HDE Gohar Shahi understands that you loving God and God loving you has nothing to do with your body – so why [involve] the bodies? This is how the message of HDE Gohar Shahi is clinical. He is not going to waste his time or your time. In order to purify your heart, you need your heart to invoke upon God with the name of his person. You cannot see God because your eyes are physical and God’s existence is ethereal. This is what the Quran said. However you will see him with the eye that God has given to every single human being so that they can see him. That eye is behind your physical eyes; it is your third eye (Latifa-e-Ana). Most Muslims believe that Prophet Mohammad is the greatest of all prophets, but it is a pity that they do not know how [he is so great]. For example, if a cricket team has the best coach in the world yet they lose every match, [they shouldn’t] be proud of their coach. The way Muslims are being humiliated all over the world gives a message. HDE Gohar Shahi has come to offer any deserving or undeserving human soul to come and learn the knowledge which will enable them to see God, [no matter what religion] they come from. They may be a Christian, Hindu, Muslim, Jew, etc. This is the divine bounty from HDE Gohar Shahi to see God. The divine mechanism and spiritual methodology is non-religious. It is purely spiritual. You don’t have to adopt a religion in order to see God today. This is an unprecedented, pioneering offer and an immaculate message. It is unbelievably true. The reason why people don’t find it to be true is because it has never happened before in history. We are celebrating all prophet’s days and we are celebrating all religious festivals and this is to give everybody a message that we respect everybody. We want everybody to become part of this divine circle.